I have a lot of bottles. Paul has dug them out of various places for me over the years. I love to use them in our home. I love the way they reflect the light. In any season, they just look right. So, there'll be more bottle shots, I'm sure. 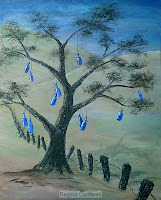 Someday, I'd like to make a spirit bottle tree. the Bottle Tree Beer Company. The first time I saw one was in the movie WinnDixie. I've since learned they are a form of folk art in the American South, having originated from Africa. I prefer the dangly ones like these. We'll see...I'll be sure to post it if I make it happen. I'm flattered to see my painting on your site! Yea! I need to remember how to get into my old account to change my name from Cornwell to Halushka. I should have thought of that before moving out and leaving my computer with my ex. Oooops! Live and learn. 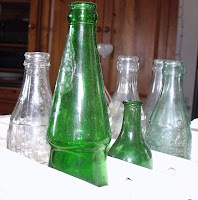 I like the other photo you found of the bottles hanging too! I've not made my own bottle tree yet--but the garden is ready for it now! Thanks! So nice to meet you ;-) Do you have a page you would like me to link to?